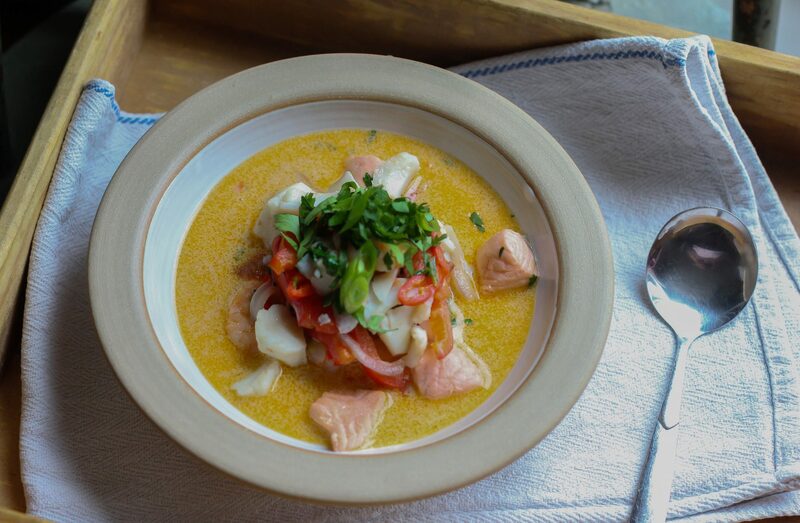 This week I have made a really simple to prepare, tasty fish soup that hails from the culinary melting pot that is Brazil. Moqueca has been made there for hundreds of years and is always on the list of ‘must try’ dishes if you visit. There are of course some variations of moqueca from region to region – this one is more akin to the Bahian moqueca from the north-east of the country which has a large African and Portuguese influence. You can use as many or as few types of fish as you want and can be adapted to suit the occasion – it can be made like a stew with less broth and served over steamed rice or in this case I have prepared it as a soup which would make an ideal summer lunch dish served with some fresh flatbreads. It is both refreshing and delicious the added bonus being that the fish, when poached in coconut milk absorbs all the lovely flavours of the broth so it’s great way to introduce fish to children’s diets. The only ingredient which is traditionally used when preparing this dish is dende oil – a vibrant coloured palm oil. Due to its mass production involving the clearing of rainforests and the destruction of natural habitats, it’s a product that has and will remain off my shopping list and is substituted here with olive oil. 1. In a pot, sauté red onion and peppers in olive oil for 2 mins. Add tomatoes, chillies, and garlic. Continue to sauté for around 5 mins. till softened. 2. Meanwhile remove skin and pin bones from salmon and haddock and cut into bite size chunks. Skoosh juice from 1/2 lime over fish and combine with prawns. 3. Pour coconut milk into pot, combine with sautéed veg. 4. Add prepared fish to pot and gently bring to a simmer, making sure the coconut milk doesn’t split. 5. Once fish is cooked, serve with chopped coriander and final skoosh of lime juice.